What if all it took to improve your running immeasurably was a few minutes marching in place? In a 2011 New York Times Magazine feature, Christopher McDougall, author of Born to Run: A Hidden Tribe, Super Athletes and the Greatest Race the World Has Never Seen experimented with just that. "I was leafing through the back of an out-of-print book, a collection of runners' biographies called The Five Kings of Distance, when I came across a three-page essay from 1908 titled 'W. G. George's Own Account From the 100-Up Exercise,'" he writes. "According to legend, this single drill turned a 16 year old with almost no running experience into the foremost racer of his day." Walter Goodall George's earliest sporting interests lay in rugby and cycling, but he went on to win over 1,000 amateur prizes and races and set long-standing records as a professional runner. "He became unbeatable over the middle distances in an era before training became scientific," the Oxford Dictionary Of National Biography writes, all while pioneering his own personal brand of "scientific" training, namely the 100-Up. In 1878, at age 19, he wrote a plan to break the then-world record for the mile—and proceeded to run nearly exactly his plan's predicted time in 1886. In addition to his 100-Up essay cited by McDougall, he also published a short book on the exercise in 1913, according to the Oxford DNB. George's 100-Up routine is divided into two parts, the minor and the major. The minor involves standing with both feet about eight inches apart "and your arms cocked in running position," McDougall writes. Then, raise one knee at a time to hip height, bringing it back down lightly to its original position. All that's left after that is to repeat this movement 100 times. Sounds a little too simple, no? 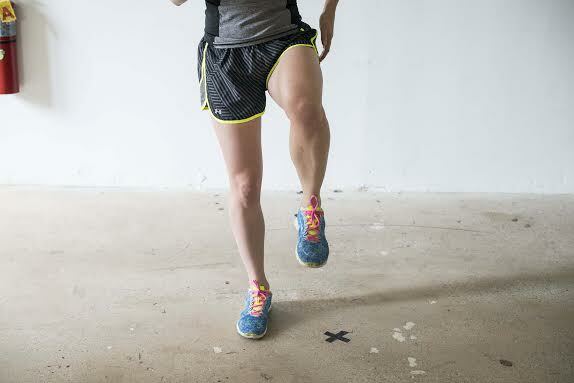 Experienced runners will likely recognize these movements as the tried-and-true running drill commonly referred to as high knees, a simple way to up strength and endurance of the hip flexor and quad, according to New York Road Runners (NYRR). Straightforward as it looks, high knees—and other running drills—can help you become a better runner, says NYRR coach John Honerkamp. The 100-Up is essentially exaggerated running form, and performing 100 repetitions can help build muscle memory during a similar state of fatigue that a runner might experience at the end of a tough workout or a grueling race, he says. But it's the focus on form that's most important. "You're reinforcing poor form if you're doing it improperly," says Honerkamp. "Once you stop doing it correctly, you shouldn't do it at all." That means concentrating not just on returning each foot to its starting point, but paying attention to arm swing, keeping the core stable and landing close to your center of gravity on the balls of your feet every single time, he says. For most 100-Up beginners, 100 reps is a long-term goal. Aim to start with maybe 20 repetitions instead—or however many you can complete with perfect form. Don't expect to see immediate results, either, Honerkamp warns. Running on your toes, typically considered more efficient because you're spending less time on the ground, may be the end goal, but heel strikers need to ease into adaptations. "I worry about people trying to drastically change,” says Honerkamp. "It's something to work on and think about, but don't over-think or overcorrect," he says. Whether or not you devote yourself to the 100-Up for life or simply dabble in running form drills periodically, incorporating focus on form into a warmup or regular training routine is a good idea, says Honerkamp. “People skip [warmups] because they're busy getting out of the door," he says, "but five minutes probably will go a long way."